This week-end, some people will be focusing on the issue of gun violence. There is a web site called "God, Not Guns" that focuses on how the faith community can talk about gun violence as a peace and justice issue. Since peace and justice issues are natural topics for discussion for faith communities, the issue of gun violence fits with the message that most religious leaders espouse. On Sunday, September 12th, my own Minister chose the Prayer of St. Francis for a congregational reading. The topic for that day was the intolerance and hate that had fomented during the weeks leading up to September 11th and the "Ground Zero Mosque" including the possible burning of Korans by Florida Pastor Terry Jones. It was good to remind us of what St. Francis was telling his followers and what he can teach us still. 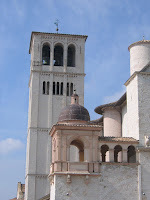 Four years ago, on a trip to Italy, my husband and I went to Assisi as part of a tour. 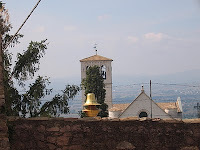 It was a beautiful city with the old city on a hilltop as so many of the Umbrian and Tuscan towns are. We were able to walk through both of the churches there- the upper and the lower, which had been opened not long before our visit after an earthquake did serious damage to the church. The story of St. Francis and his teachings was written in words and pictures all around the walls of the upper church. There was a service in the lower church which we briefly observed. We were there close to the October 4th celebration of St. Francis "feast day" and the anniversary of his death ( October 3rd). As a result, there were many people of faith and the Catholic faith, in particular, in Assisi while we were there. The old town above the beautiful church was charming with it's winding narrow brick streets not meant for cars. People live along these streets where their earthly needs are brought to their homes by bike, or carts or on foot as the streets go higher and get narrower. Unexpected turns surprised us with views of the valley below and the fall landscape- gold vineyards and yellow sunflowers. It was truly peaceful and felt almost spiritual. St. Francis is known by Catholics as the Patron Saint of animals and the ecology. I am not Catholic so I not so familiar with the Saints. There are several churches in my community though that perform the blessing of the animals. I like the beginning of the Prayer of St. Francis:" Lord, make me an instrument of your peace, Where there is hatred, let me sow love; where there is injury, pardon;..." Certainly working towards a country where gun deaths and injuries are not so pervasive and working towards public safety, peaceful solutions to arguments, preventing children from having access to guns and encouraging people, if they have guns, to store them safely, is working towards peace and justice. The United Church of Christ church to which I belong has been supportive of my efforts. Themes of anti-violence in general and in particular, violence against women, children and people of color, are often front and center at my church. Also discussed are ways to prevent violence. Many in my congregation have signed post cards and resolutions. My church joined in the lawsuit against the state of Minnesota over the requirements in the Minnesota Personal Protection Act to post signs on the outside of our building and to require greeters to inform people they shouldn't carry guns into church. We won a brief reprieve and stopped the law for a year until it was passed again. I have blogged about this previously. 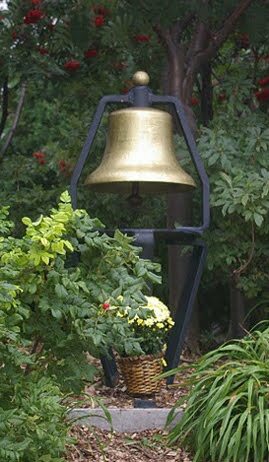 We have held bell ringings at my church and public forums about the gun issue. My minister helped me celebrate my sister's life on the first year anniversary of her shooting by reading the homily from her funeral ( not performed by my minister). Since her funeral was not in my city, many of my friends could not attend so this was a way for them to experience with me, the wonderful words about her from the funeral. My church is a very important community shared with me by others who view the world and their faith in a way similar to my own beliefs. There are hunters and gun owners there. They have signed a resolution in favor of the gun show background check bill. They don't have a problem with the bill and know it will not restrict any of their rights. I also know that they don't believe that God gave them the right to keep and bear arms but rather that owning guns is a personal decision having nothing to do with their faith. I value their opinions and their willingness to join me in seeking a better world where people are not shot to death in large numbers daily. On this week-end, no matter what faith you profess, I hope you will think of the victims of gun deaths and injuries and give a prayer or a thought to the families and friends who remember them. To Sean whose comments I find offensive and provacative- it's Sunday. I'm going to church now and if you are involved in a church, maybe you will, too. I will not be taking my gun nor will anyone inside of my church be armed. Thank God for that. You can do as you please. I am well aware of the church shootings in this country. They happen everywhere. To suggest that people need their guns everywhere is just not what most people think and most people are not carrying guns everywhere. But go ahead- it's your "God given right" though I haven't seen anything in my Bible about that. " Remember that "Peace" is not the absence of violence. Peace is the presence of justice. Don't pretend that being unarmed in the face of oppression, whether private or governmental, is "peace."" To this I could not disagree more. I am not publishing your comments as written by you. I find them to be counter productive to any serious discussion. Just a quick question; can you share the scriptures in the new testament where Christians are told not to defend themselves? "But I say to you, do not resist an evil person; but whoever slaps you on your right cheek, turn the other to him also." I am aware that you guys use those passages as justification for saying that Jesus would think that carrying guns was something he would have condoned. I doubt that anyone of right mind believes that to be true. But whatever. I know you will throw that one back at me. I like my reference to "turning the other cheek" better, and you like the one about "taking up swords" better. Touche. Where are we in the end with this one? I agree that there's no mandate in the bible to own weapons of any kind, and even agree that while I think the bible never tells us not to defend our lives, it doesn't say that we can't make choices as to what types of weapons we believe civilians should have access to. i.e. if you believe civilian gun ownership is bad, or ownership of some types of weapons or in some manner, there's no biblical reason not to pursue that. But don't claim a biblical support, as it's a secular decision. But why would you want a church to get involved in a divisive issue? Culture's come and go, political belief's come and go, economic systems come and go, regimes come and go, but a church exists for one reason and one reason only: to help bring people to the faith. And that is well above any political considerations. But as for the "turn the other cheek" or if someone makes you walk a mile "walk two miles" or other cases ... Jesus is very clear that as Christians we must not escalate violence, and we should try to be peacemakers. But every single example he gives is on an act of humiliation or, at worst, non-life endangering violence. He never says, "and if the thief doth stab you in one kidney, offer him the other. and then your heart." He doesn't say "and if the rapists do defile one daughter while you stand by and do nothing, offer them the other." There is nothing in the bible for or against any particular weapons or class of weapons, there is nothing in the bible for or against defense of life or family or even property taken through legal means. Yes, you are right about nothing in the Bible about either point of view really- regarding weapons in particular. We all know that a lot of violence has been purpetrated in the name of religion for centuries. I choose to believe that faith communities are generally interested in non-violence in general and in peace and justice issues. At least, my experience in my city is that most of the churches have supported our efforts. If you belong to a church that believes that violence is a means to some sort of end, then so be it. Or if your church thinks it's fine to openly carry your gun, fine. That is not what I choose and I will continue working with faith communities. Oh, and maybe you have forgotten all the things with which some faith communities have chosen to be involved- abortion and gay rights as two examples. I am not going to get into a theological debate here. Given the background of the "turn the other cheek" surely that isn't the best you can come up with. The Jew of Jesus' day would have understand a 'slap' was the equivalent of legal insult -- one given by a lord to a servant or a master to a slave. Jesus was saying not to return violence for an insult but to force the person to recognize you as an equal. Only equals were slapped on the left cheek. Given the relatively innocuous nature of the physical violence; many scholars do not see that scripture to be a requirement for non-violence. The other often scriptures are of a similar nature. Roman Law required any non-Roman citizen to carry a soldier's pack for a mile. There were penalties attached for the soldier who required a person to carry the pack for more then a mile. Jesus advocated (if you are required to go a mile, go two) of putting the person in the position of stopping you from being so helpful as to get them in trouble. Should I go on or do you have better scriptures? The question was actually about the New Testament but thanks.The Old Testament is full of imagery such as the one you cite above. It is about preparing for war and battle. Well, Bob, I did say I was not a Theologian. What are you trying to prove here? Everything I say you feel you absolutely MUST come back with something better. Give it up. It's tiring. The God of the Old Testament is still the God of the New Testament. God didn't change, doesn't change. If He approved of violence in the Old Testament, he approves of violence in the New Testament. It sounds like you fancy yourself an expert in just about all matters.